Genies has just launched its first iOS and Android mobile app designed to let users build a three-dimensional cartoon version of themselves — one that looks and acts just like you. Created by Akash Nigam, Matt Geiger, and Evan Rosenbaum, Genies uses advanced artificial intelligence that lets you communicate through your avatar and act out keywords and sentiments in reaction to what you type. 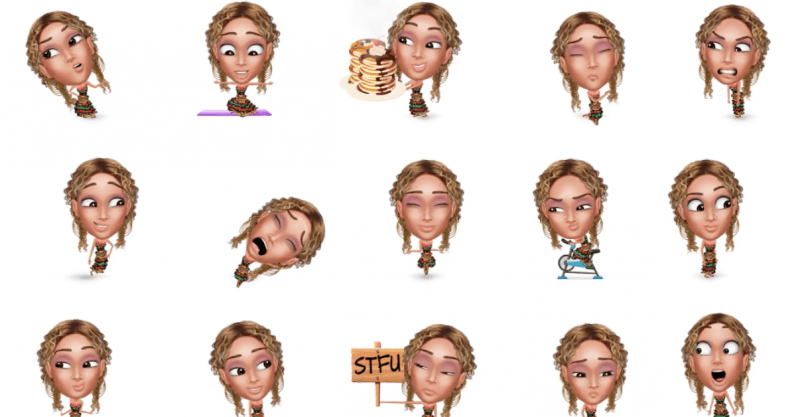 Genies is quickly becoming Snapchat-owned Bitmoji’s rival as more than one million people have created a digital clone of themselves using Genies’ proprietary technology with over a million customization options — from personality types, likes and dislikes, to eye, hair, and skin color. Genies can be integrated into dozens of messaging apps such as Facebook Messenger, iMessage, and WhatsApp — but your biggest group chat will probably have to wait as Genies can only be used in chats with up to six people. The company’s engineers and researchers tested its feature on millions of live chat platforms to create an algorithm that can detect and recognize more than 180 dimensions of emotion changes and create automated responses like a human would. Presented on editing wheels, the app‘s more than one million customization options has everything from personality types and likes and dislikes to eye and hair color, skin tone, and clothing. With every skin tone, hair style and color, face shape, eye color, and head shape available, making your identical digital twin is as easy as it sounds — although I definitely made a cooler and better looking version of myself. Once you’ve created a better looking version of yourself, you can go back and edit at any time whether you’ve changed your hair style or fancy an outfit change. Your digital clone will not just look like you, but it can also act like you in real-time on messaging apps. Users can make their animated clones copy their movements and facial expressions by tapping any of the millions of “actions” offered — whether it be a thought, feeling, or emotion. The company’s first global advertiser, Gucci, provides 200 pieces of luxury avatar clothing from the high-fashion label’s real-life collection. In the future, Genies will introduce more appearance features that users will be able to purchase. How does Genies make money? The creative startup is launching a software developer kit that charges other apps licensing fees to let users create avatars and use them for chat, stickers, games, animations, and augmented reality. Genies raised $10 million in its second round of funding, bringing the total capital raised to $25 million. A wide and diverse range of investors for Genies includes leading venture capital firms, business executives to musicians, athletes, and celebrities such as Tony Robbins, A$AP Rocky, Offset from Migos, Shawn Mendes, The Chainsmokers, and 50 Cent. Genies hopes to improve the way humans communicate both digitally and face-to-face. By designing digital clones that not only look like you, but also act like you — Genies allows users to express themselves in a more authentic way. Notes: In order for Genies to work, users must allow the app to harvest their contacts.